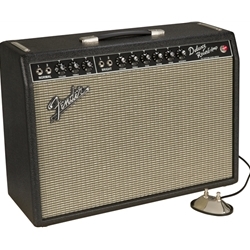 Today, we're very pleased to offer this AMAZING Fender '64 Custom Deluxe Reverb 20W 1x12 Tube Guitar Amp! This point-to-point hand-wired amp is true to the classic original, but is built better than ever before with modern construction techniques. It's no exaggeration that this is quite possibly the finest amp Fender has ever offered!